There’s nothing quite like sitting by the fire, under the stars when camping. I love sharing the experience of camping with my kids and making new family memories. When we go camping, I make sure to have some games to play while camping available. 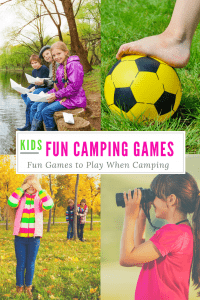 When you go camping with kids, it’s always a good idea to have some games ready to play. 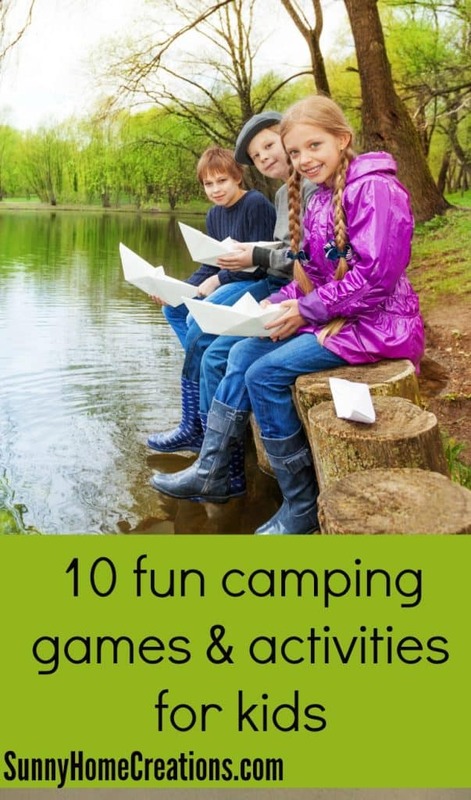 Here are 10 fun camping games and activities that your kids are sure to love. Who doesn’t love a good scavenger hunt? This is a great game, although it does require a bit of prep before playing. Create a list of items each person needs to find. For younger kids who are unable to read, use pictures in place of words. You can attach this list to a bag or you can use an egg carton like they did at healthymamainfo.com. This list can have specific items such as a pine cone or it can be more generic like they have to find something with the color yellow. You’ll give a copy of this to each person playing. Set the kids loose and see what treasures they come back with! Hide and seek is a lot of fun to play when camping. So many places to hide. If you have older kids you can play it in the dark with flashlights – just make sure you aren’t making a lot of noise too late and be respectful of other campers if you are at a campground with others around. How high will the seekers be counting? What are the boundaries of the game? How far can people go when they hide? Is climbing trees to all the way up allowed? Who will be “it” or the seeker next? The first one found or the last? In case you don’t know how to play, here are the rules. One person is the seeker. The seeker is going to count to 100 or whatever number was decided upon before playing. While the seeker is counting, everyone else is hiding. The people hiding need to make sure to stay in the boundaries that were decided upon before playing. Once the seeker has counted to the number they need to count to they yell out “ready or not, here I come!” and then start trying to find everybody. Hide and seek is a favorite among my kids and their friends. They especially love playing it in the dark. It gives them a chance to use their flashlights and adds an element of spookiness and fun that you don’t get in the daylight. Sardines is another fun game to play while camping. This game is very similar to hide and seek. So here is how you play. The first thing you do is figure out who is going to be the first person to hide. Everybody else is together in one spot and they count to whatever number was decided on before the game started. While everyone is counting, the one person goes and hides. After everyone is done counting, they split up in different directions to find the person who hid. When someone finds this person, they quietly hide with this person, in the same hiding spot. This continues until everyone finds the hider. The last person to find the hider, is the hider for the next round. We’ve had a lot of fun playing sardines in the past. The hard part about this game is making sure the person who is hiding finds a large enough place that everyone is able to fit and able to get in the hiding spot. We’ve had a few times where this wasn’t totally thought through and after the 2nd person got into the hiding spot, there was no more room, yet there were still several kids who hadn’t found the hider yet. Also, we had a time where one of the adult children (aka one of the Dad’s) decided to climb a tree as his hiding spot. Needless to say, the younger kids had no chance of being able to get into the hiding spot. This is my husband’s favorite game to play when camping. Divide into two teams. You need multiple people per team. Set your boundaries that you will play in and divide this boundary into two sections. Each team has one section. Decide on the rules for prisoners. If someone becomes a prisoner, you can set it up so they are a prisoner for the rest of the game. You can also have it so if someone becomes a prisoner, someone from their own team can come over, hold hands with the prisoner and get back to your own boundary without being tagged. You can come up with all sorts of variations of this rule, everyone just needs to know what the rule is ahead of time. Each team plants their flag anywhere in their own section/boundary. It is the team’s objective to capture the other team’s flag and bring it to their own base, which means just bringing the flag across the boundary into your own team’s boundary. If you get caught and tagged on the opponent’s side you will be taken prisoner. Always make sure to bring a deck of cards camping with you. There are so many card games you can play. If it becomes rainy outside, you can always retreat to your tent and play a game in there If you don’t know many card games, make sure to pick up a book of card games to bring with you. Here are some ideas on different card games you could play. There are so many good and fun card games you can play. The ones I put in the list above are just some simple ones that I think most people already know about. My husband and oldest son have a week-long birthday camping trip they take each year. They both love playing card games after they’ve been out fishing and are lazing about after dinner during this time. 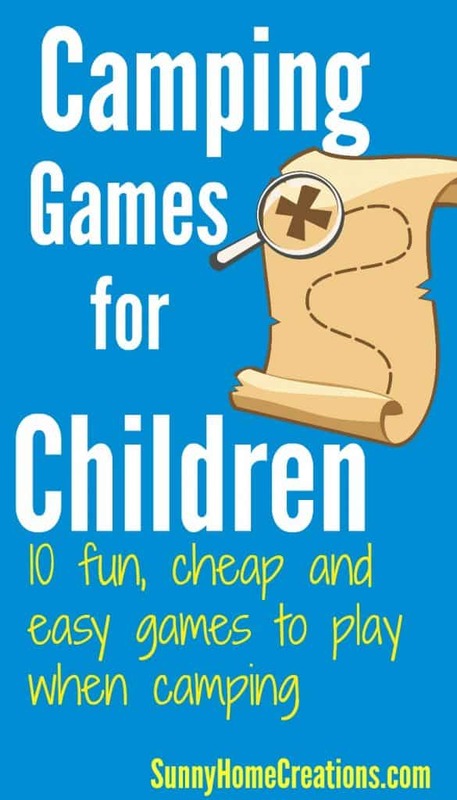 If you need some fun card games to play, check out this book. Super simple to play. All you need is a baseball or some type of ball and a baseball mitt for each person. Take turns throwing the ball to each other. You can also throw around a frisbee to each other. This is our favorite frisbee. If the place you are camping at has a lake, pond or creek, you could all create paper boats, then watch them float. I wouldn’t do this at a river, as the swift-moving water will move too quickly and your boats will soon be lost. For some great directions on how to make paper boats visit www.patchofpuddles.co.uk. My kids and I have made paper boats many times and most recently, we’ve tried making them waterproof by coloring one whole side of the paper with a crayon, just like she talks about at Patch of Puddles. It actually works quite well to do this, just make sure you don’t get water on the side that isn’t protected by the crayon. Make sure to bring a soccer ball and pump with you. If there is a field you can kick a soccer ball back and forth or start up a game of soccer. 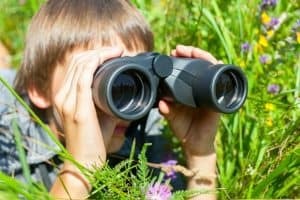 Bring along some binoculars and a good bird book for your area and spend an afternoon looking at the birds. If you are quiet you might be able to hear them singing and chirping. You can look up the birds in the book you brought along. I’ve saved the best for last! OK, maybe not everyone’s favorite, but it’s for sure one of my favorites! 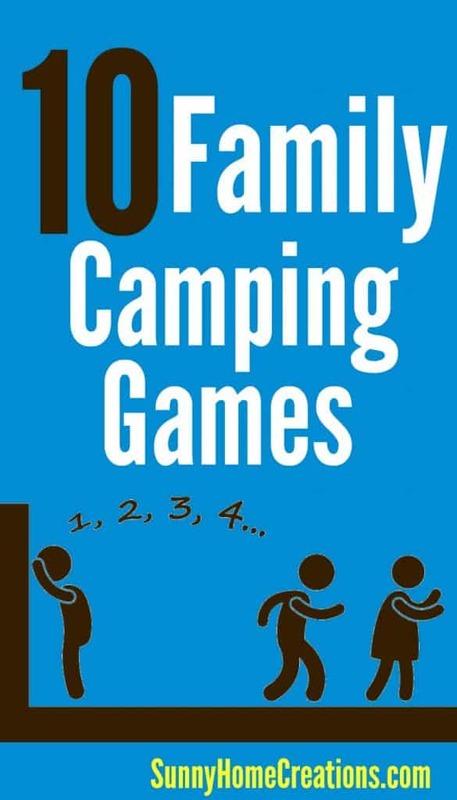 The gist of this fun camping game is the kids will get a clue, this clue has a rhyme telling where the next clue is. The kids follow each clue, until at the end they arrive at the “treasure”. This treasure can be anything – icy cold drinks, glow sticks, yummy snacks, stickers or anything else you can think of. When I am writing out the clues, I start at the treasure, write the clue for the treasure on a piece of paper and find a good place to hide this clue. As soon as I hide the next clue, I write the clue to find the one that I just hid. I keep doing this until I’ve decided that I have written out enough clues. My kids all love a good treasure hunt. As a parent, this is probably one of my favorite games. I find it fun figuring out the clues to use and then seeing how much fun my kids are having while they race from one clue to the next and them working together to try and figure out the clues is very endearing to me. 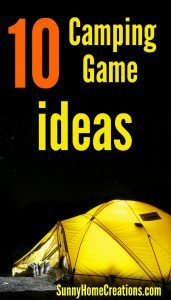 I hope this list has given you some ideas of games to play while camping the next time you go. What are your favorite games to play while camping? Let me know in the comments below. If you found this helpful, I’d love for you to “PIN IT“!